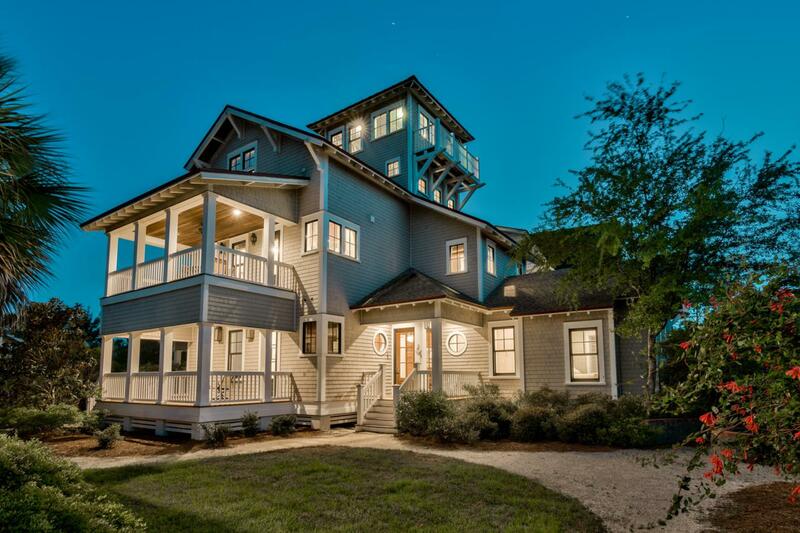 Recently updated, in the gated WATERSOUND BRIDGES community you will find this gorgeous 5 bedroom/4 1/2 bath home with serene Gulf and Camp Creek Lake views. This spacious lot is one of the largest in Watersound Bridges, located just down the street from the community pool and beach. You will have ample parking for you and your guests in the large driveway and 2 1/2 car detached garage, with finished carriage house above. The ground floor is perfect for guests with its own living room, service kitchen, three bedrooms and two full baths. This ground floor living area has a gas fireplace and ample room to relax with two private porches. The 2nd floor is perfect for entertaining. You'll find the ideal open kitchen, plus an indoor & outdoor dining room.